It’s time tae tak tent o the Scottish weemin o the early 20th century for thair muckle contribution tae the airts and cultur in modern Scotland. 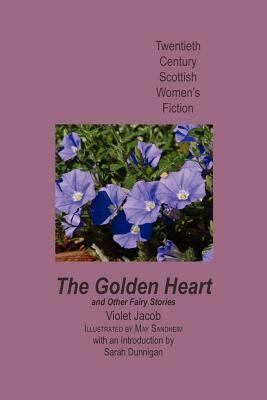 We hae a braw curn o gleg scrievers, the likes o Marion Angus, Nan Shepherd, Willa Muir and Helen B Cruickshank, aw fae the Nor-Aist o Scotland, an amang thaim my ain favourite is Violet Jacob (1863-1946). As an airtist, scriever o novelles, shoart stories an verse she set furth in ‘her wee blue buikie’ – as she cried it – a collection o poems in the Scots Leid cawed Songs o Angus (1914). There, she depictit the fowk o Angus and the wey o life oan the fairms, in the sma touns and veelages scaitered aroun and aboot, aye gein the chairacters thair ain distinct vyce o Angus. Violet Augusta Mary Frederica Kennedy Erskine wis born in 1863 at the bonnie Hous o Dun juist ootwith Montrose in Angus. As the dochter o the 18th Laird, she wis withoot doubt, weel-aff and haed a fouthie stert tae life, but no withoot wae; her wee brither John leived for jist 3 days, her Faither deed whan she wis 7 year auld, her aulder sister Millicent deed at 16, and her ither brither the 19th Laird deed at sea whan he wis jist 42. Aye haein a strang sibness wi her mither, Violet Jacob wis sae shapit and thirlt growen up at Dun, at she grew browdent on the place, an this lestit her haill life lang. Horsemen wis highly regairdit, respeckit an better peyed than ony o the ither fairm wirkers. Violet Jacob wis a skeelie horsewummin hersel and juist mebbe she wis hyte on ane growin up at Dun – wha kens? 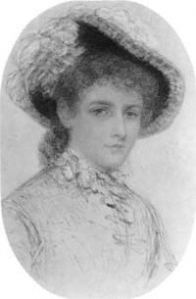 She mairriet Arthur Otway Jacob in 1894, an Irishman in the 20th Hussars – aye, she gat her horseman efter aw – and haudit furth till Indie wi her anely bairn Harry whan he wis nae mair than twa month auld. She wan tae Indie in December 1895 and scrievit while thare her Diaries and Letters from India (1895-1900) an it wis thir at set Violet Jacob apairt fae aw at I jaloused about sic a genteel wummin. She wrat tae her mither at she wis fell keen tae git outside o the Cantonment and see the real Indie. Houiver, awbody roun about her wis tellin her no tae bather an at thare wis nocht tae see. Violet Jacob’s repone tae this wis at she kent thair sort weel and she wis gaein onywey! Sae, aff she gaed, out on horseback wi a tent tae explore Indie fur hersel, on the fang fur aw aa the sichts, souns and, in parteecular, the flouers o Indie. Mony o Violet Jacob’s botanical pentins are hauden at the Royal Botanical Gairdens in Edinburrae. Her bairn Harry wis weel kent fur crackin awa in a mixtur o Hindi and Inglis and she wis eident for him tae ken aw about Indian folklore and muckle about the kintra whaur he wis bidin. I dinnae think mony guidwifes o Breetish airmy officers haed the same conceit as Violet Jacob did back in the 1890’s! The Jacobs left Indie in 1900. Ane o Harry’s hinmaist letters tae his mither afore he deed aifter bein woundit at the Battle o the Somme in 1916 wis adheebit ‘Your loving devoted Buddha’. Like the feck o mithers back in 1916, Violet Jacob niver got ower the loss o Harry. The dowie and waesome More Songs O Angus wis set furth in 1918 tae help her thole her yaukin stounds o pyne aifter Harry’s daith. Violet Jacob wi perfiteness captured the dree o life aifter the war whan sae mony were amissin; and she did it wi hert-peetie an mense. At is anither reason why she is respeckit sae faur ben in Angus the day. Violet Jacob said o her hame aifter Arthur’s deith in 1936, at the anely thing at wid stap her fae brakkin her hert wid be tae bide in Angus. An sae she flittit back in 1936 and steyed at Marywell Hoose in Kirriemuir till her daith in 1946. Guid tae ken that. Their brawest lyrical poems mind me o MacDiarmid’s early lyrics, an whiles hae the same fey souch tae aboot thaim. Luik forrit tae hearin mair at the Collogue on Setterday. A grand piece! Mony thanks! Ah’m aff tae buy a copy o her warks the noo. Inspiring stuff. Cannae beat Angus tae sooth a sair hert. Whit a makar she was, the leid seeps out o the lan itsel! Norlan Wind is the sang whae grups the exile’s saul, syne hauds on! Jist reread this braw piece that I had a quick keek throu a while back when I wis leukin for somethin else. Whit a wice-like an movin appreciation o ane o oor finest lyric poets, a maist remarkable wuman that suffert mony a broken hert. Her empathy wi folk that hae suffert loss as she did rins throu her verse as does her great love o the folk an place a her hame country that helpit tae heal her pain. Mony thanks Lisa an sorry I misst yer talk. Smashin piece on slavery tae.